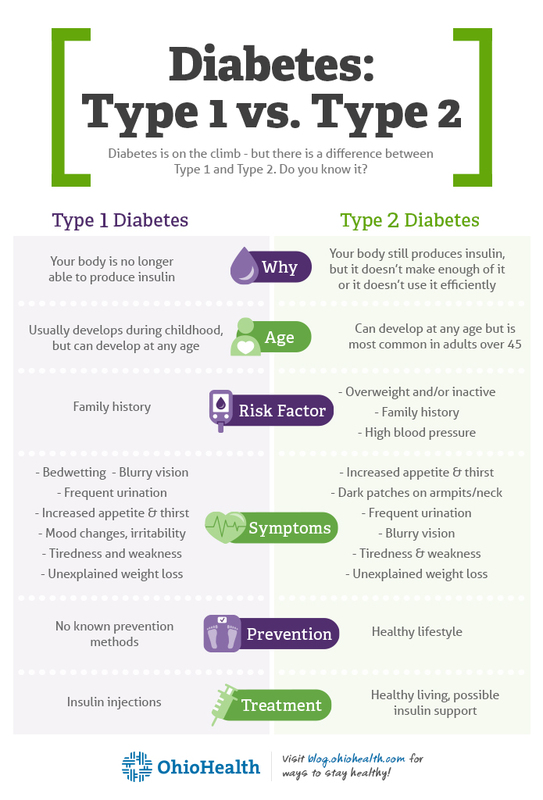 You’ve probably heard about type 1 and type 2 diabetes, but do you know the difference between them? Our bodies convert the food we eat into sugar, called glucose. In response, the pancreas produces a hormone, called insulin, that delivers the glucose to our cells to give us energy. When you have diabetes, this process gets disrupted. Type 1 diabetes is when your body is no longer able to produce insulin. It’s usually diagnosed during childhood, but it can develop at any age. An autoimmune response. Your immune system malfunctions and attacks the insulin-producing cells in your pancreas. Once the cells are destroyed, your body cannot produce insulin. There seems to be a genetic component to the disease. A family history of type 1 diabetes increases your risk of developing it. There is no way to prevent type 1 diabetes. People with type 1 diabetes must take insulin injections every day to survive. Type 2 diabetes is when your body still produces insulin, but it doesn’t make enough of it or it doesn’t use it efficiently. It’s the most common form of diabetes. Type 2 diabetes can develop at any age but is most common in adults over 45. Doctors are not sure what exactly causes type 2 diabetes. However, age, weight and inactivity play a major role. A healthy lifestyle can go a long way in preventing type 2 diabetes. Maintain a healthy weight through good nutrition and exercise. Most people can control type 2 diabetes with a combination of healthy eating, exercise and medication. Some need insulin injections. Do you have more questions? Schedule an appointment with a doctor today.